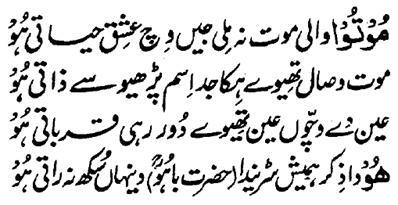 Hazrat Sultan Bahu Rahmatu-Allahe Ta-aala Alaihe says that 'O Seeker! As long as you will not virtually die before the death in which there is the life and existence for the Aashiqeen, you will not received the undying life! When we read the Name-Allah-the-Essence (Ism-e-Allah-Zaat) , our death reflected the Wisaal with the Real beloved and we received Fanaa and Baqaa in the Fountainhead of the Essence and, in this way, we reached higher than Angels even. The Zikr of Hu burns us always due to which peace is not got every day and night.